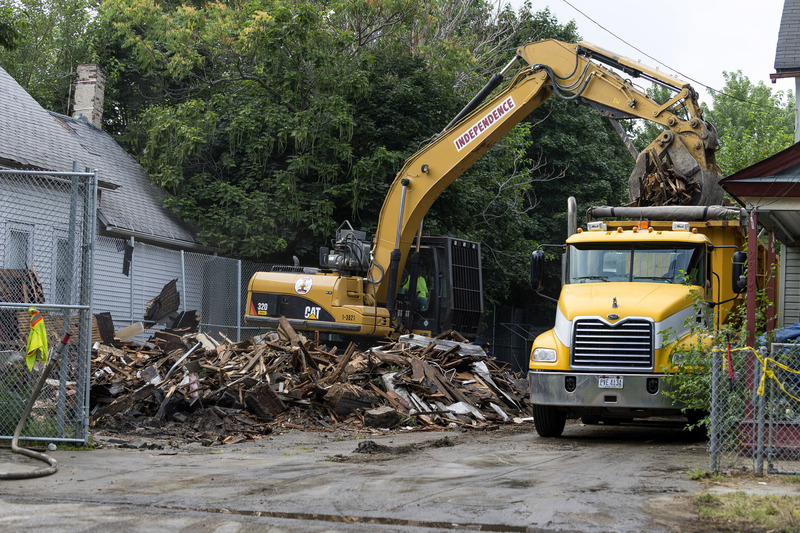 On Wednesday morning, construction workers in Cleveland, Ohio publicly tore down the once-home of jailed kidnapper Ariel Castro. Michelle Knight, one of the three women Castro kept captive in the house for a decade, looked on as builders set to work. She later released dozens of yellow balloons at the site in honor of other abductees. "Nobody was there for me when I was missing," she said, "and I want the people to know, including the mothers, that they can have strength, they can have hope, and their child will come back." Neighbors clapped and cheered as the demolition process began. Two companies offered to raze down Castro's home for free during his trial, but Castro himself was court-ordered to pay the $22,000-plus cost of demolition. Community officials said they didn't want the house becoming a macabre shrine, nor a testament to the abductions that neighbors had to see on a daily basis, and so immediately ordered its destruction. The three women Castro abducted were offered the $22,000 figure, but all chose to donate it to the neighborhood. After the community "catches its breath" from the events of the trial, said authorities, those who live there will decide what to do with it. Knight herself said she wanted a garden to be built on the site. Last Wednesday, Castro was sentenced to almost a millennium in prison, with no chance of parole. "It's fitting," said prosecutor Tim McGinty. "He's going to sit in the bowels of prison now the rest of his life, the rest of his days, in fear himself of the other prisoners."